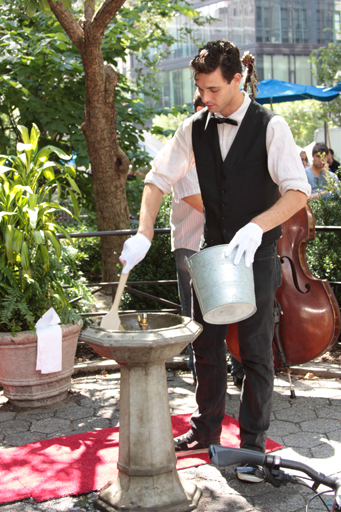 The invention of the modern drinking fountain in 1906 by Luther Haws was a significant innovation that improved public spaces dramatically by helping to deliver sanitary drinking water to anyone. Today, the number of public drinking fountains is decreasing, and it is leading to problems. This past month, the Washington Post published an article that explains why this is happening, and why it’s not good. Below is an introduction to the article, which can be read in full here at the Washington Post. “The event, called ‘Respect the Fountain,’ was staged by a group with an unlikely mission — to make water fountains cool again. Fountains were once a revered feature of urban life, a celebration of the tremendous technological and political capital it takes to provide clean drinking water to a community. Even the International Plumbing Code, followed by builders in most American cities, has signaled that the fountain is out of style. In the 2015 edition of the manual, which lays out recommendations on matters such as the number of bathrooms an office should have and how pipes should work, authors slashed the number of required fountains for each building by half. Have you seen a Brita® Hydration Station®? Haws hasn’t done a whole lot to counteract this trend, either. I haven’t seen or heard from a Haws product rep in years. There must not be anything “new” in drinking fountains to talk abut. Their newsletter tends to be focused on industrial and safety applications, which indicates to me that’s where their focus lies. Engineers vs architects. I was at one of the major amusement parks in southern California recently, and while filling up my water bottle, wondered why don’t they have Hydration Stations all over this park. Probably because Haws hasn’t come up with a way to blend the Hydration Stations into a design theme. They come in any color, as long as it’s white. Great article and great comment about the Brita stations. As I was reading, I was thinking about the Brita stations as a great advancement that I’ve seen recently. We have Brita water filling stations at the Atlanta Botanical Gardens, and I use them every time. I find that I consciously bring a reusable container when I know that there are filling stations. Great advancement on Haws part!